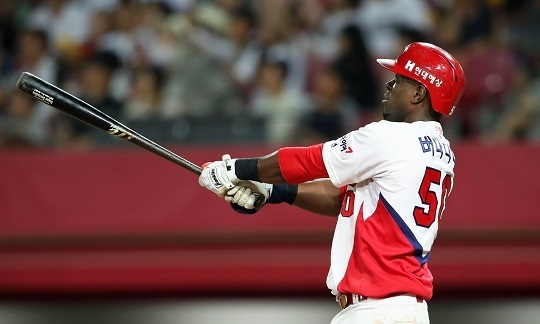 In the Kia Tigers’ 9-3 victory over the KT Wiz on Thursday night, Kia center fielder Roger Bernadina became just the third foreign player in Korean Baseball Organization history to hit for the cycle. Bernadina got the most difficult of the four hits out of the way in the first inning, lining a ball just past KT first baseman Yoon Suk-min into the right field corner for an RBI triple. He then showed off his speed and hustle on his second hit, a third inning double. While it initially appeared his soft flare into left-center field would be just a two-out single, Bernadina surprised center fielder Mel Rojas Jr. and the rest of the KT defense by accelerating after rounding first and taking the extra base. The situation repeated itself in his third at-bat in the fifth inning. Bernadina aggressively rounded first after hitting a blooper that fell just in front of Rojas Jr., but this time retreated to first instead of attempting to advance. Bernadina next came to the plate in the eighth, and with Kia leading 8-3, it seemed likely he would only have one shot at hitting a home run to complete the cycle. He did just that, crushing KT reliever Jo Moon geun’s 1-0 fastball over the wall in right-center for a solo shot and the cycle. Bernadina’s home run, his 19th in the season, moved him into a tie for ninth on the KBO home runs leaderboard. Bernadina is now hitting .320 / .383 / .551 on the year, good for a 135 wRC+ (16th in the KBO) and 3.92 WAR (sixth among KBO position players). Bernadina’s cycle was the 24th cycle in KBO history, and the fourth cycle hit by a foreign player. Manny Martinez hit the first in 2001 for the Samsung Lions, and Eric Thames hit two in 2015 for the NC Dinos. There have been two other cycles hit this season, the first by Nexen's Seo Geon-chang on April 7, and the second by Doosan's Jeong Jin-ho on June 7.